Always plant in a well drained soil. To test for soil drainage, dig a hole for your new plant and fill it with water. If the water doesn’t drain in 12 hours, the soil in that area will need to be amended dramatically. What Plant Form are You Transplanting? Your tree or shrub will come in two forms: Balled and burlapped (B&B); or containerized. Containerized or B&B plants can be planted any time the ground is not frozen. If possible plant your tree or shrub as soon as you get it home. Otherwise, it may dry out and become injured. If you can’t plant it immediately, place it in a shady and/or sheltered location. Keep the soil moist until planted. DO NOT remove the wire basket. Once the enriched soil has been placed 3/4 of the way up the root ball, cut & fold down the top 1/4 of the basket & burlap, remove any strings around the tree trunk. Fill the remaining hole with enriched soil to its original level. Ease the pot off without disturbing the root ball. If the roots are extremely compacted, you may need to make a few shallow cuts through the roots on the side and bottom of the root ball. Mix the soil taken out of the hole with Bumper Crop then backfill around the root ball. Tamp the soil lightly every 2”-3”, and fill the hole with the enriched soil to its original level. Use excess soil to build a ring 6” –10” from the outside of the hole. This will help the water to move slowly down to the root zone of the plant as well as minimize the runoff. Remember, if it rains for 1 hr, it probably was not enough water for a newly planted shrub or tree. Water your plants thoroughly, then remove them from their pots by inverting them and supporting the root ball. If the roots are compacted, you may need to make a few shallow cuts through the roots on the side and bottom of the root ball. Place your plant into the hole. Add the enriched soil to ground level. Water the plant thoroughly to ensure the soil fills in completely around the roots, eliminating air pockets. Apply Rootmaster B1 at this time. Reapply Rootmaster B1 at every watering for the first year. Monitor your plants daily. Water slowly to attain deep water penetration which encourages widespread root development. Feed perennials bi-weekly with Bud & Bloom fertilizer. Add a 2”- 3” mulch layer around the plant. 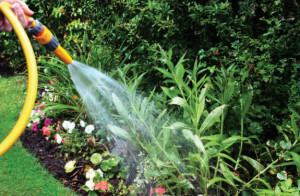 This will prevent water loss and keep mowers & trimmers from getting too close to the plant. Avoid overly deep mulch against the stem or trunk of the plant, as this can promote disease or pest injury. Unless necessary, trees should not be staked. 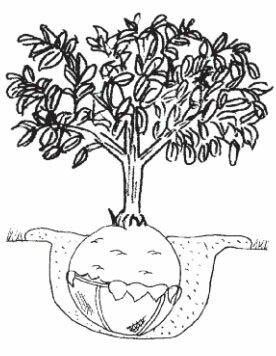 If your tree or shrub is top heavy or in an exposed area, you may stake the plant to anchor the root ball so roots can develop rapidly into the new soil around the tree. Connect the stakes to the trunk with flexible lines and straps designed for this use. Allow for some movement in the plant for strong growth. Remove the stakes and lines after one growing season so you do not inhibit trunk development. 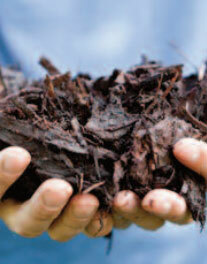 Add a 2”-3” layer of shredded mulch or chips around the plant. This will prevent water loss and keep mowers and trimmers from getting too close to the plant. Avoid overly deep mulch against the trunk or stem of the plant as this can promote disease or pest injury. Plant your plants around your planting area while still in their pots. Make sure you have taken into consideration the mature height of the plants as well as the sun or shade requirements. Determine an appropriate location for planting, then dig a hole2 times the width & 6”-8” deeper, replacing with enriched soil (compact this 6”-8” of soil) Add a generous amount of Bumper Crop to enrich the soil. Blend into the soil. An all-organic soil builder with high organic nutrient content and endo- and ecto-mycorrhizal fungi. A fertilizer for all new plantings of sod or seeded lawns, shrubs, ground covers, flowers, or bare root plantings. Provides the right nutrient mix to develop a sturdy root system and strong top growth. Formulated to reduce plant shock and improve resistance to stress. Improves water and nutrient uptake.